I’m gettin all healthy on ya today. I’ve been at the grocery store A LOT lately. Grocery shopping has always been a weekly highlight for me, because obviously I live on the edge. Some people spend Saturday at the mall buying shoes; I spend Saturday at the grocery store buying new kinds of flour and chocolate. I mean, um, vitamins. In one of my recent grocery trips, I discovered those bags of prewashed, precut kale in the produce section. I know, I’m a little behind the times and mayyyybe a little lazy in that I don’t like to spend one minute washing and cutting those huge kale leaves. But after living abroad for a year with a reduced number of fresh greens available and a thorough cleaning process required for all vegetables, my eyes popped out of my head and my jaw hit the floor when I saw this convenience superfood. They must know me. Something scary is happening to me, and it’s called I never want to go back to the grocery store ever again. Making the drive, zigzagging across the store to get what I need, waiting in line, bagging my stuff, awkwardly speed walking it out to my car because I’m apparently always in a hurry, and repeat that once, sometimes twice, daily for almost three weeks? It makes a person fall out of love quickly. Good news: there’s only FIVE DAYS left until I am done with my eCookbook and can stop going to the grocery store every day. Let’s celebrate with a sale! Sign up here to get an email notification with a discount code when the book comes out, you creamy cauliflower sauce lovers, you! So confession: I actually really like eating this balsamic KALE salad, and so does Bjork (!). It makes me feel good and happy and lucky to have the opportunity to eat such healthy food. <– 100% serious. After living in a developing country for a year, I am much more aware that it’s a privilege to have access to nutritious food like this on a regular basis. And if the choice involves warm olive oil and balsamic sauteed kale, tossed with garlic-butter mushrooms and tender sweet bell peppers and Asiago cheese, with a dusting of sea salt and a sprinkle of black pepper? I say thank you, YES. This salad is like one million flavors in one, and here’s the funny thing: every time I make it, I add something new. It’s an everything but the kitchen sink kinda salad: fresh basil, or dried cherries, or grilled salmon, or feta, or brown rice, or rosemary garlic sauce leftover from one of my eCookbook recipes. It all just works. 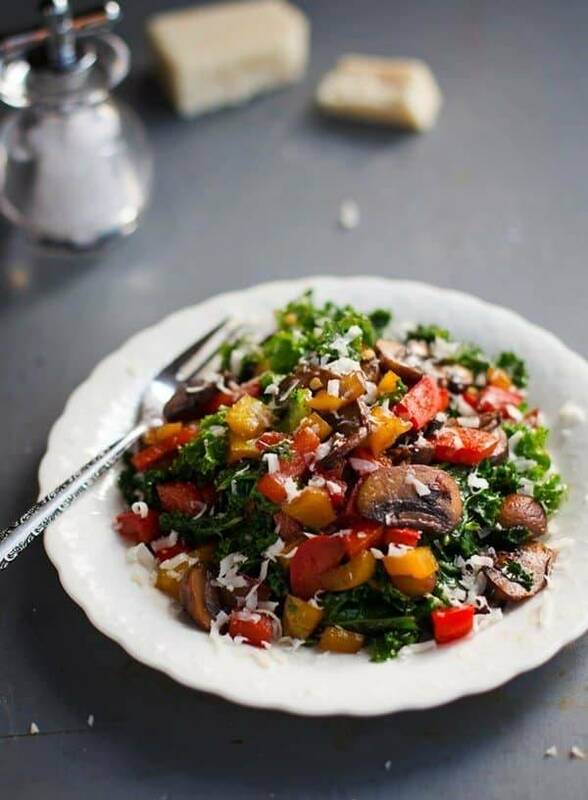 This warm balsamic kale salad has tons of flavor and includes sauteed mushrooms and peppers, bell peppers, and Asiago cheese. In a large skillet over medium heat, melt one tablespoon of butter. Add the onions and peppers; saute for several minutes until softened. Add the mushrooms and one tablespoon butter; saute for several minutes until browned. Add the kale, garlic, and balsamic vinegar. Saute until the kale is deep green but not yet wilted. Remove from heat and serve topped with Asiago or Parmesan cheese. Season with salt and pepper to taste. You can also add a protein for a more filling “meal” salad, like grilled salmon, chicken, white beans, etc. I also liked having this over a brown rice/ancient grain blend. Eat kale and be happy, and someone please sign me up for Coborns Delivers. This salad looks amazing! I need a plate of health like that these days. I could eat this for breakfast, lunch, or dinner! LOVE! One of my most dreaded task is washing and cutting kale. I have no idea why, but I really hate it!! I so wish my grocery store had the pre-cut stuff. Oh man, oh man that would be awesome! Now, this salad is also awesome! I love that it is warm and full of color! Those are personally my favorite kind of salads! Kale, something I always need to eat more of these days! I love kale! I haven’t done grocery delivery service, but my sister in Seattle does Amazon Fresh (which is only available in Seattle, sadly). She loves it and and was talking about it non-stop. After visiting her and seeing how awesome it is, I’m totally considering trying one here, though!! Right now I do most of my grocery shopping at complete opposite places – the farmers market and Costco. Ha!! Amazon Fresh? Sounds amazing! Of course they would in Seattle. of course. I love kale salads – I will be trying this one soon! You had me at garlic-butter mushrooms. Those things are like kryptonite. I love Kale 🙂 I want also to let you know that Pinch of Yum is now by far my fav food blog (I’m a new reader!). You guys rock! I use a grocery delivery service! It’s kind of a godsend in New York, when I have a huge shopping expedition I need to do. I get all the heavy stuff delivered- cans of food, milk, etc- and then I buy the produce myself in the store or farmer’s market because I’m picky like that. I love the warm olive oil on this salad! Kale salads make me happy these days, too. That just sounds tasty…then you see the pics and bam! I want to make it! On the not of grocery shopping my wife and I have noticed that our grocery shopping experiences are all reflective on where we go. If we go to the hi end markets, we pay more, but have a better “experience”. Ie there is lots to look at, samples galore, people with similar interests, and big pickles in a big jar. If we go to like a Fred Meyers, we want to get in, get out, and tend to hate and fight the crowds. We have started to spend more just so we can enjoy the grocery shopping experience! Beautiful salad! Sounds delicious and wonderful presentation. Great job! I love kale salads, and thank goodness for the pre-cut, pre-washed stuff. I don’t want to trim that stuff down and chop it all the time. This sounds heavenly with all of these great veggies and my favorite — balsamic! I wouldn’t mind buying pre-washed kale if it still meant that one huge bag of kale still only cost me 98 cents. Fat chance for that, though, right?! Recipes like this one in which you can add leftovers and make it different each time are so nice and easy! I totally just discovered the awesomeness that is kale, and now need to try this! Balsamic is like my favorite thing ever. Borderline obsession. This looks so good! And yes! I use grocery delivery. I get my product delivered through doortodoororganics.com … and other groceries I get through greenpolkadotbox.com … green polka dot box is awesome, they work like a natural foods/online version of Costco–so you pay a $50 membership fee and then you get wholesale prices for all of their stuff! So the lady I babysit for gets her groceries from Safeway delivered. She does all of her ordering online, and it’s delivered the same day every week. She SWEARS by it. But I don’t know, as a huge foodie, I personally LOVE the grocery store and would feel weird not making my weekly (and lets be real, more like daily) trips. But I can see how if you have a ton going out it can be pretty convenient. Ps. This salad looks amazeballs and I can’t wait to try it! 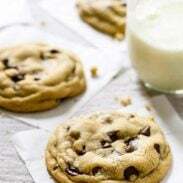 I cant find the link to sign up for the discount code to order your cookbook. Hi Debra, looks like there’s a hiccup with the sign up form! Working on getting it fixed now. Thanks for letting me know! Isn’t it sad that healthy, nutritious food is a privilege? I’m an urban planner by education and a foodie by love and I find it so heart-breaking that the disenfranchised don’t have access to healthy food and, at least as far as the US goes, a lot of this has to do with policy and politics. So frustrating! This salad looks really delicious! I am usually not a fan of grocery shopping. Whenever I mention this, people always tell me the secret is to go really early, like 8 a.m. I try and when I do, it works out great and I tell myself I will always do this.